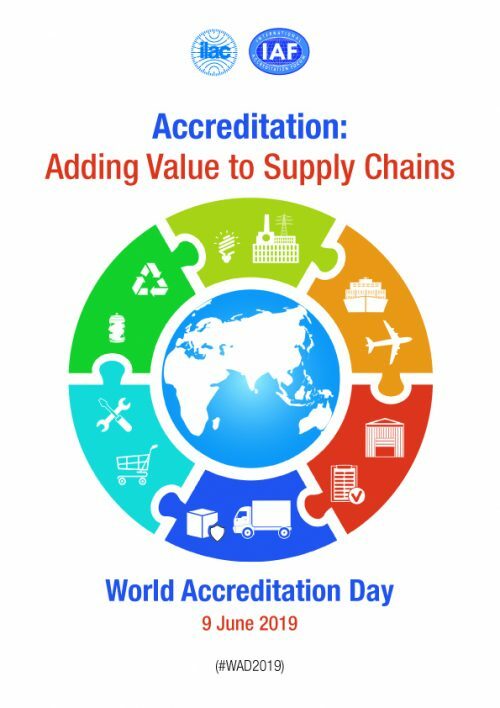 9 June 2019 marks World Accreditation Day as a global initiative, jointly established by the International Accreditation Forum (IAF) and the International Laboratory Accreditation Cooperation (ILAC), to raise awareness of the importance of accreditation. This year’s theme focuses on how accreditation provides added value to supply chains. Supply chains provide a vital role in delivering products and services for consumers, business and the public sector in a timely, cost-efficient and quality manner. Accreditation and, with it, other quality infrastructure tools such as standards, metrology and conformity assessment, provide widely accepted tools that help deliver value to the supply chain. These tools help with trust and assurance, enabling confidence in both final products and services and the manner in which they are placed on the market and used. Previous World Accreditation Day publications are available here.